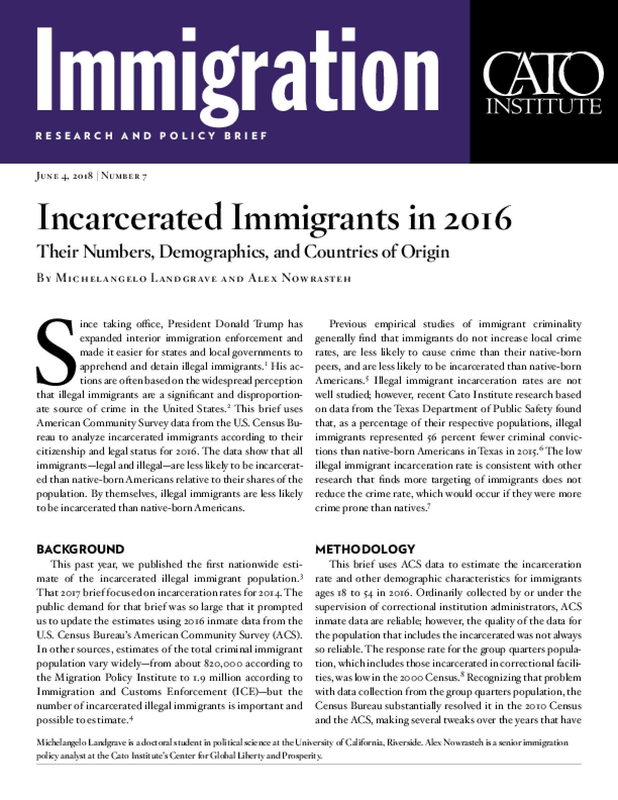 This brief uses American Community Survey data from the U.S. Census Bureau to analyze incarcerated immigrants according to their citizenship and legal status for 2016. The data show that all immigrants—legal and illegal—are less likely to be incarcerated than native-born Americans relative to their shares of the population. 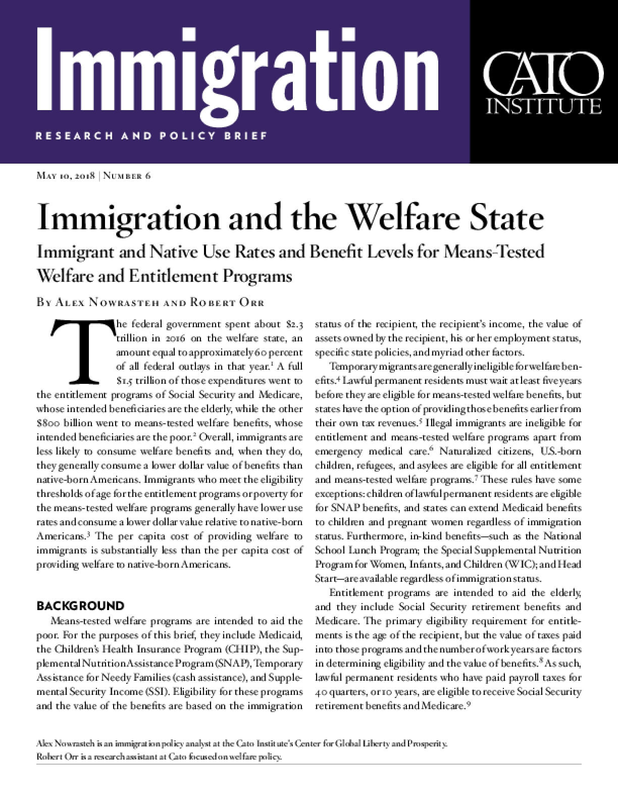 Overall, immigrants are less likely to consume welfare benefits and, when they do, they generally consume a lower dollar value of benefits than native-born Americans. This appears contrary to the study conducted by the CIS (Publication 3), but Cato claims its work is more accurate because it examines individuals with immigration status, while CIS measures welfare use by households headed by immigrants (which often contain multiple native-born Americans). 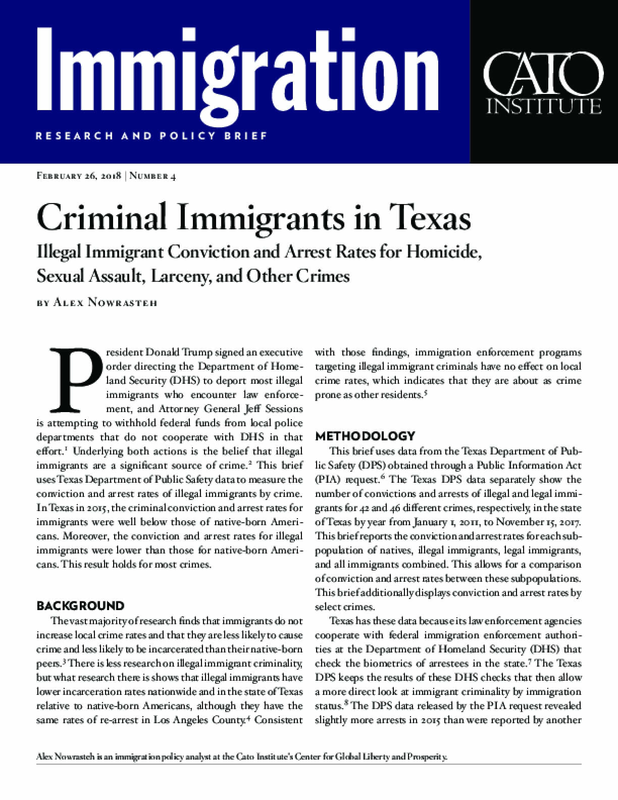 This brief uses Texas Department of Public Safety data to measure the conviction and arrest rates of illegal immigrants by crime. In Texas in 2015, the criminal conviction and arrest rates for immigrants were well below those of native-born Americans. Moreover, the conviction and arrest rates for illegal immigrants were lower than those for native-born Americans. This result holds for most crimes. 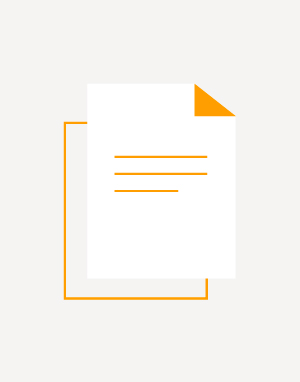 As Congress and the Trump Administration debate immigration policy reforms, one critical—and often misrepresented—piece of information is the extent to which individuals in immigration removal proceedings comply with their court appearance obligations. 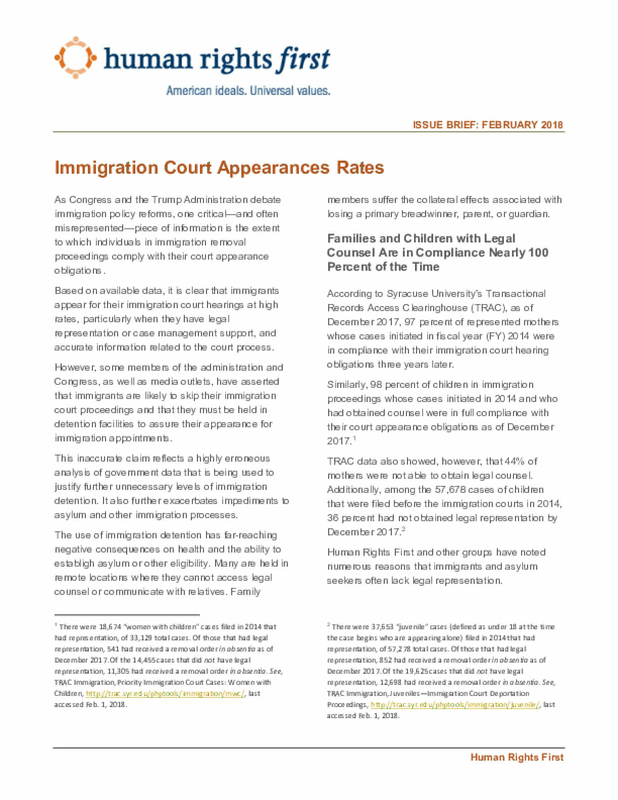 Based on available data, it is clear that immigrants appear for their immigration court hearings at high rates, particularly when they have legal representation or case management support, and accurate information related to the court process. Border management is a complex and challenging field, whose aims are as varied as they are vital. In a world where passenger numbers are increasing, large numbers of goods are crossing borders and serious security issues have arisen, border management is tasked with contributing to a high level of security and facilitating legitimate crossborder flows (of both people and goods). In recent years, the large-scale collection of information and the implementation of technology for border management tasks have been key developments aimed at supportingthese goals. At the same time, these developments have elicited challenges from fundamental rights defenders who have outlined the potential ways such information could be misused or lead to detrimental consequences on fundamental rights. Moreover, the impact of forced displacement and the knock-on effects large-scale flows had on the EU (especially on the integrity of the Schengen area) have underlined how such a crisis can reverberate from a border management issue across other policy areas and into the political arena.As such, border management has been and will continue to be a touchstone in a debate on how to equally ensure both security needs and fundamental rights. 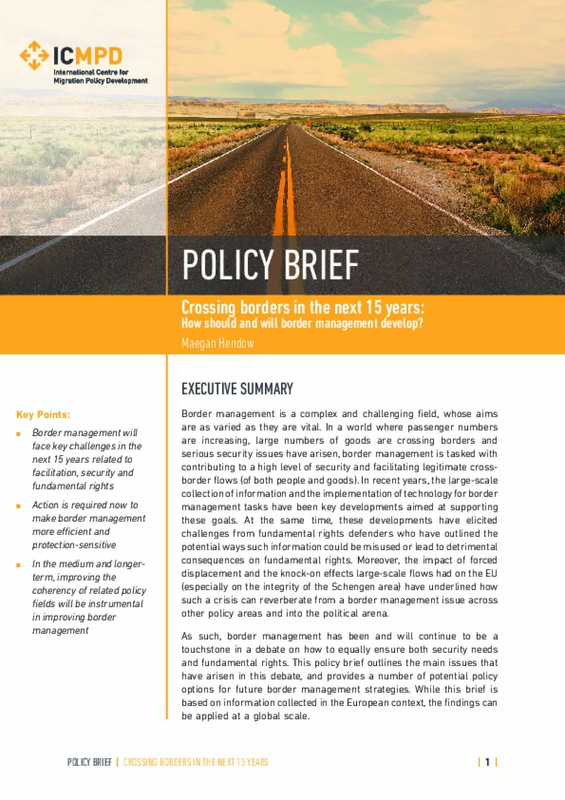 This policy brief outlines the main issues that have arisen in this debate, and provides a number of potential policy options for future border management strategies. 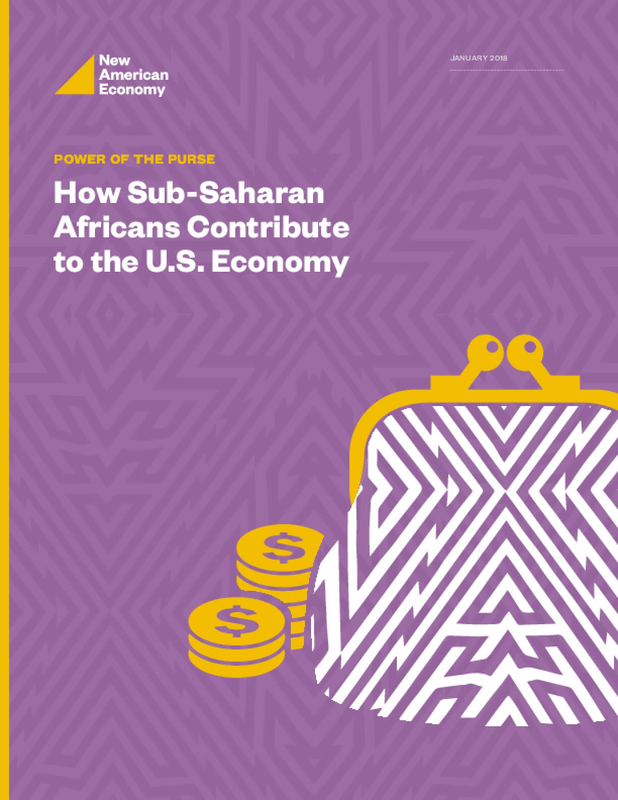 While this brief isbased on information collected in the European context, the findings can be applied at a global scale. Immigration policy has been and continues to be a controversial topic in the U.S. Over the course of the election and since taking office, President Trump has intensified national debate about immigration as he has implemented policies to enhance immigration enforcement and restrict the entry of immigrants from selected countries the Administration believes may pose a threat to the country. The climate surrounding these policies and this debate potentially affect 23 million noncitizens in the U.S., including both lawfully present and undocumented immigrants, many of whom came to the U.S. seeking safety and improved opportunities for their families.They also have implications for the over 12 million children who live with a noncitizen parent who are predominantly U.S-born citizen children. 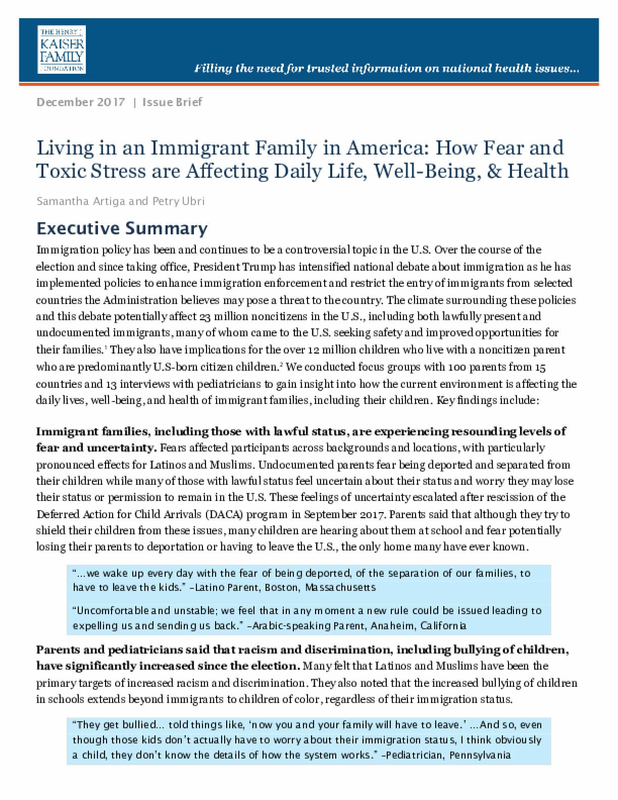 We conducted focus groups with 100 parents from 15 countries and 13 interviews with pediatricians to gain insight into how the current environment is affecting the daily lives, well-being, and health of immigrant families, including their children. Most economists agree that immigration boosts productivity, raises the Gross Domestic Product (GDP), and prevents labor shortages. In 2016, one in six workers in the United States was an immigrant. These immigrant workers finance a major share of Old Age, Survivors and Disability Insurance (OASDI) payroll taxes that fund Social Security. The restrictionist Reforming American Immigration for Strong Employment (RAISE) Act proposed in 2017 would halve the number of green cards granted yearly and change the criteria for awarding them, moving from a largely family-based system to an employment-based one. The bill aims to raise wages for American workers and promote economic growth. 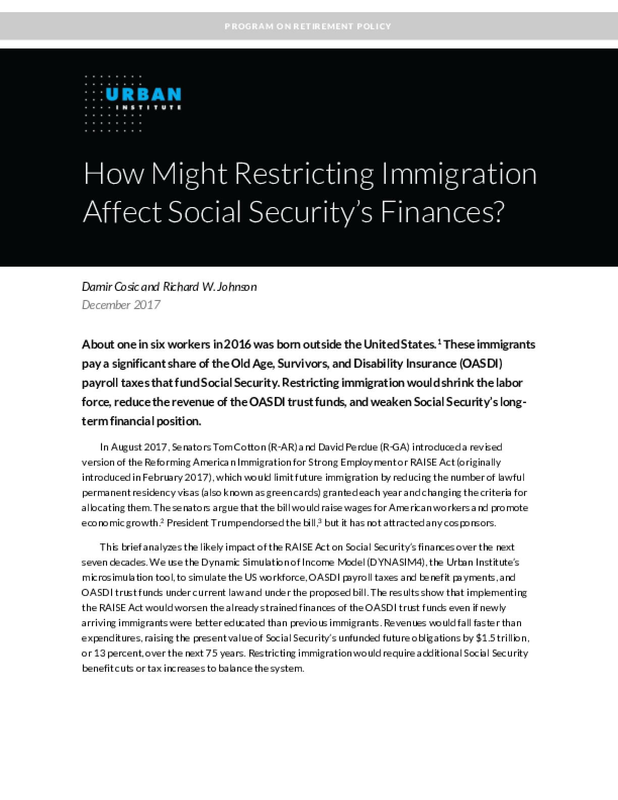 In How Might Restricting Immigration Affect Social Security's Finances, the Urban Institute analyzes the proposed bill and concludes that the RAISE Act would shrink the number of workers by two million workers by 2030 and 8 million by 2070. As a result, it would weaken Social Security finances by reducing OASDI payroll tax revenues. Over a 75-year period, the RAISE Act would increase Social Security's unfunded obligations from $11.6 trillion to $13.1 trillion. Additional analysis finds that restricting immigration would reduce GDP and have only marginal impact on American wages (no more than 0.16 to 0.23 percent). The authors warn that policymakers should reconsider supporting legislation such as the RAISE Act as it would exacerbate Social Security's financial problems and do little to improve the wages of the U.S.-born. 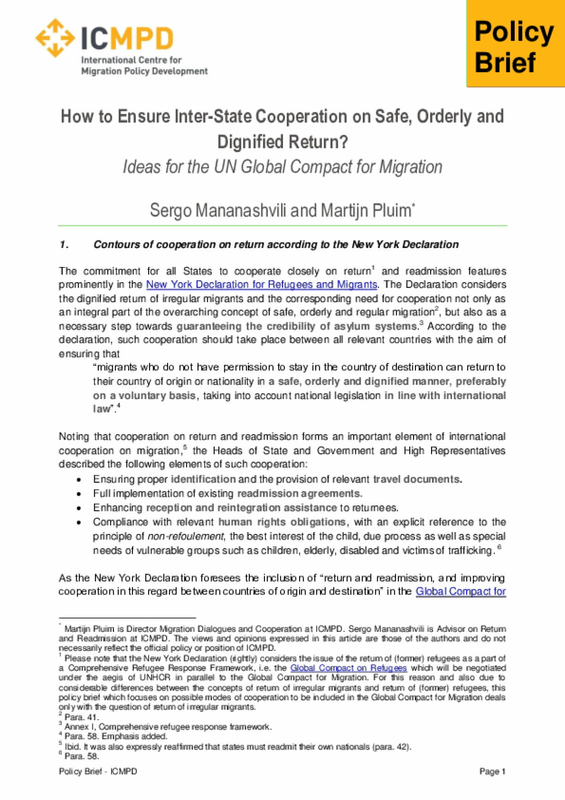 The International Centre for Migration Policy Development (ICMPD) holds that the main overarching purposeof the Global Compact for Migration (GCM) should be to improve global migration governance and supportstates in achieving this aim – putting forward concrete measures to improve the safety of migrants, ensuretheir human rights are respected, and promote regular migration channels, while discouraging irregular ones.This should include highlighting concrete ways for UN Member States and other relevant stakeholders to bothmanage current and potential future migration contexts, as well as to strengthen migrants' contributionsto countries of origin, transit and destination. 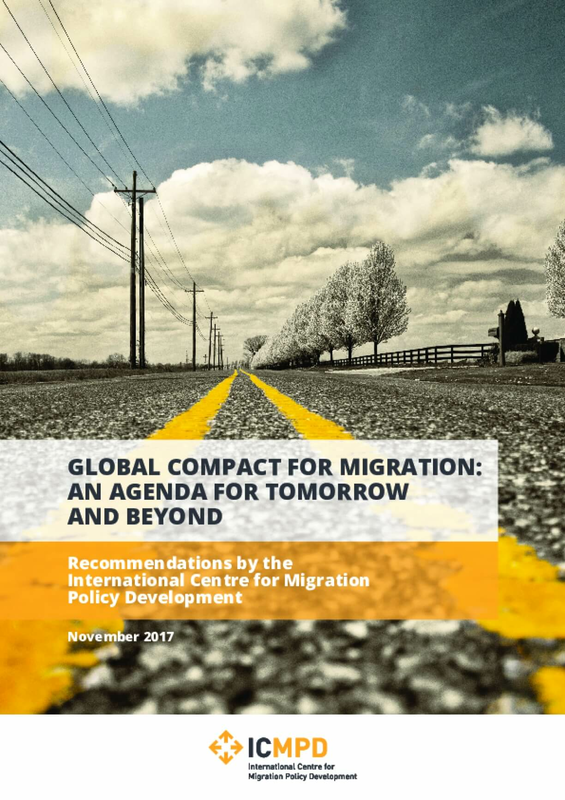 ICMPD stands ready to support states in achieving the goalsset out under this Compact, particularly at the national, sub-regional and regional level, where we are bestsituated to support the implementation and monitoring process. The Migration Observatory has shifted thinking on contentious migration issues by providing the first UK source of independent, high-quality evidence and analysis aimed at public audiences.